The gender fluid potter Grayson Perry has unveiled The Brexit Vases his latest artwork ahead of his show at the Serpentine Gallery which opens later this week. The two vases, which took 5 months to complete depict the battle over Brexit, with one showing remain the other leave. 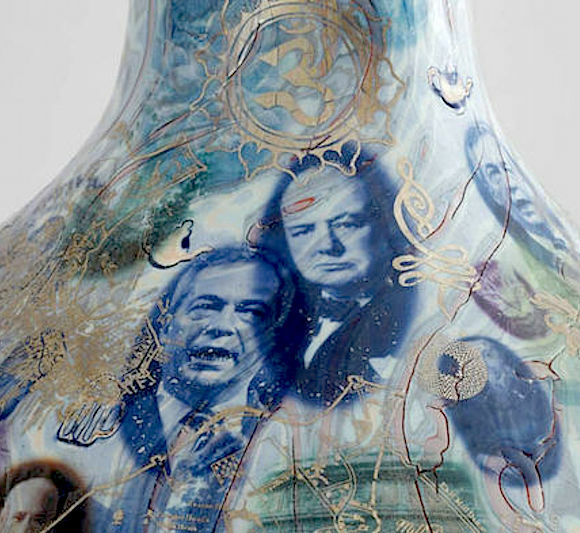 The large leave vessel features images of Sir Winston Churchill, Nigel Farage, the Queen, Sir Francis Drake and a jar of Marmite. The Remain pot includes the late MP Jo Cox, presenter Gary Lineker, Barack Obama, Gandhi, Shakespeare and logos for Waitrose and the NHS. The Turner Prize-winner, 57, ran a social media campaign to find out what people on both sides of the argument thought and worked from photos submitted. “The two pots have come out looking remarkably similar, which is a good result, for we all have much more in common than that which separates us,” he said. “They are one artwork,” he stated. The two vases made by Grayson Perry have so much in common but are so far apart: they are identical in size and shape; are mostly blue; have images of teapots, bacon and eggs, families by the seaside, walking the dog, and going down the pub. But between them, they represent the opposing sides of the most bitter political debate in a lifetime: Brexit. “I asked people to send in their ideas for what should be included, what represented the whole thing to them, even what colour they should be, and they’ve come out surprisingly similar. I actually found it rather touching,” the artist said.